Whether you made it to the corner office or you’re building your home office, a mission style desk may be the perfect fit. At DutchCrafters you’ll find the very best Amish desks from the best woodshops in America. Start with the Iris Mission L Desk or your favorite desk design, then build a matching Amish office furniture set to go with it. Ryan B, the category manager for Office Furniture, gives his expert advice on shopping for office furniture. After years of managing relationships with our Amish woodworkers and managing products on our website, he knows what makes this desk special. In this video, Ryan B will tell you about the desk features, the collection, and more. An overview of desks and the office furniture category on DutchCrafters. 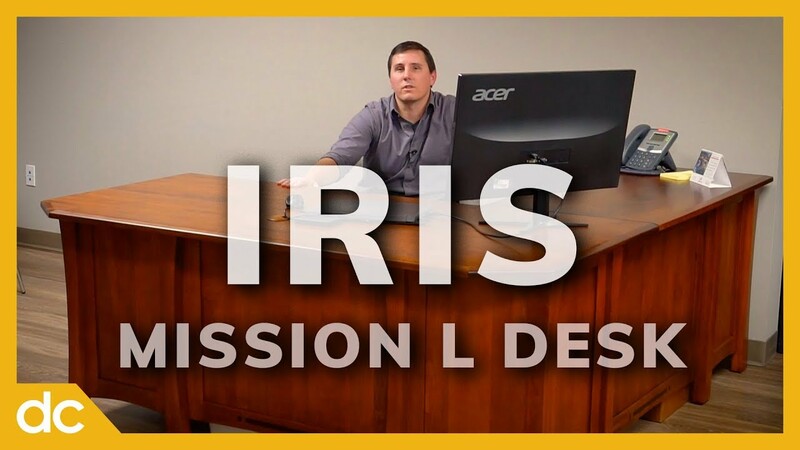 The Iris Mission L Desk does it all. It blends the casual, flat panels of mission design with the elegant professionalism of a corner L desk. This desk offers an optional hutch top to provide lots of additional storage. Or, you can opt for standalone office storage in the form of the matching Iris Mission Style Bookcase, Iris Mission Style File Cabinet, or Iris Mission Lateral File Cabinet. Corner L Desks are a great choice for any office with the space to accomodate them. They blend the prestige of an executive office with the convenience of abundant storage. As explained in the video, the L desk consists of a desk side and a return side. The desk side is designed to be open to the room: it typically features a full overhang to allow guests, coworkers, or clients to pull up a chair across the desk from you and comfortably work with you from the far side. The return, by contrast, typically has a shortened overhang to allow the flexibility of sliding it up against the wall or keeping it open to the room. The hutch top, if added to the desk, will go on top of the return and usually up against a wall. When ordering from DutchCrafters, all of our L desks offer the option to swap the desk side and return to fit your office. And there is no shortage of customizations available to you with a made to order product like a solid wood desk. The only limitation is your imagination!